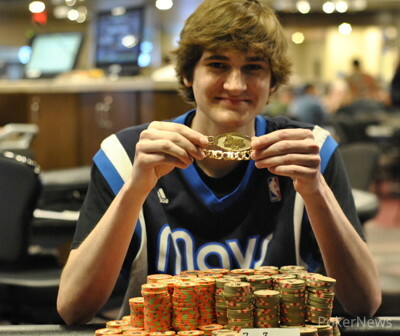 "So, this is why you play tournaments," said a friend of Will Pengelly's as Pengelly smiled and stacked towers of chips in preparation for a winner's photo at WinStar River Poker Series $2,500 Main Event. "This is why you play tournaments," Pengelly confirmed. 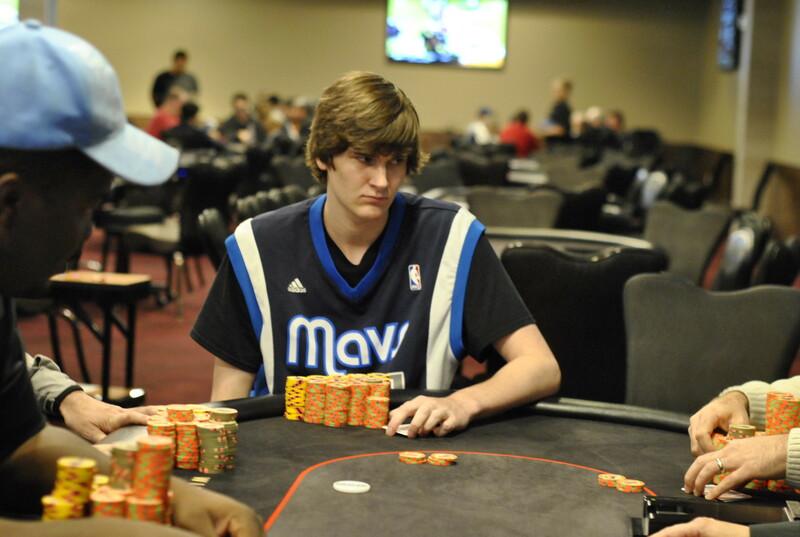 Just 20 years old, Pengelly skipped class for the day at University of North Texas to come play out the final table at WinStar. As the top dog in a five-way chop, he's now taking home a sum most people his age couldn't dream of pocketing: $249,310. 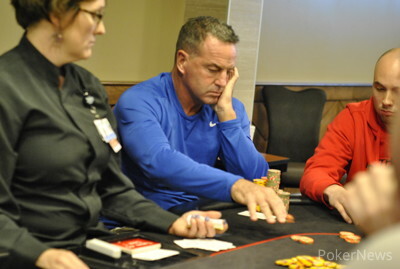 Cash games are Pengelly's bread and butter, as he's been grinding at WinStar since he turned 18. He decided to take a shot in the WinStar Main despite never having cashed in a tournament after a nice run in the local cash games. "I think of tournaments kind of like the lottery," he said. "Many people enter and one player wins a lot of money. Today, that happened to be me." It certainly didn't look like the lotto was going to land on Pengelly's lucky number early. 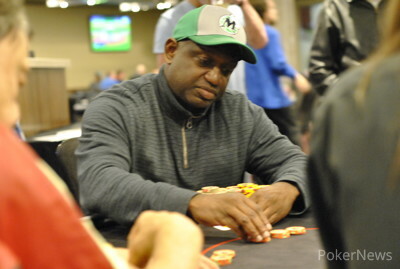 After the elimination of short stack Brian Green almost right away, Pengelly twice picked up queen-ten suited and flopped open-enders with flush draws. Both times, he bricked out, the second one especially costly as he got stacks in against Dean Baranowski's top two. Reduced to one of the shortest stacks, Pengelly waited for his spot and then got in a big flip with ace-king suited, once again flopping a combo draw. This time, he got there by pairing up on the river against start-of-day leader Johnny Deas, and he was back in business. Deas had a miserable Day 2 as it was almost all downhill after the first half hour or so. Perhaps feeling the squeeze of his sinking stack, he picked a bad time to shove with fives after a jack-high flop, as Pengelly had flopped top set for basically a zero-sweat knockout in a huge pot. Pengelly, clad in his trust Dirk Nowitzki jersey. All of a sudden, Pengelly had gone from a shoving stack to near the chip lead in a matter of minutes. Nebraska native Jeff Banghart then notched consecutive eliminations. First, his ace-queen held against Alan Cummins' king-jack reshove. Then, he raise-called ace-nine for about 23 big blinds against Matthew Bray, who jammed ace-four blind versus blind and wasn't exactly pleased with Banghart's call. There had been some discussion of a chop before, and it recurred with five left. The five looked at the ICM numbers and quickly found them agreeable. 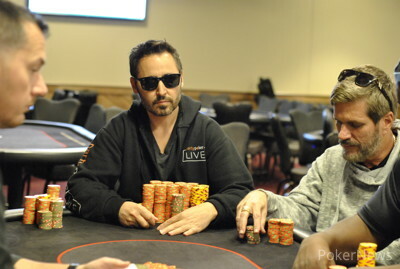 Pengelly had the chip lead and took $249,310, followed by Ekrem Bozkurt with $215,170, Banghart with $206,570, Ricky Green with $205,710 and Baranowski with $144,000. They played out a turbo for the bracelet and Pengelly had that wrapped within an hour, winning his first big tournament shot. Throughout the latter stages of the event, Banghart offered fatherly advice to Pengelly, telling him not to quit school no matter what the result of the event. As a finance major, Pengelly will likely be more shrewd with his newfound cash than many his age. "I really want to buy a nice car but it will most likely be going into the bank," he said. And then? It's off to Vegas for his first WSOP as he'll be of legal age by the time the summer rolls around and the semester is over. "Yeah, I will certainly be going there to check things out," he said. Will Pengelly called 500,000 from Ricky Green and they both checked the flop to a board of . Pengelly checked and called 500,000. On the river, Pengelly shoved all in and Green quickly called. Pengelly showed for the flush and Green tabled , meaning Pengelly adds the bracelet to his top monetary prize. Ricky Green raised to 400,000 on the button and Will Pengelly made it 1,200,000 in the big blind. Green called and the flop fell . Pengelly led out for 1,800,000 and Green made a quick call. The turn was the and Pengelly announced all in. Green snap-folded and Pengelly moved into an overwhelming lead. Will Pengelly raised to 300,000 on the button, Ekrem Bozkurt made it 1 million and Pengelly shoved all in. Bozkurt quickly called and showed . Pengelly said he had "Johnsons" and showed . The board ran , so Pengelly sent Bozkurt packing and Bozkurt shook everyone's hand and headed to collect his money. After Jeff Banghart tripled up in back-to-back hands moving his stack up to 1,000,000 chips, he was all in again on the button. Will Pengelly called from the small blind and the cards were on their backs. The board ran out and Pengelly's ten-high proved to be good enough to eliminate Banghart. Jeff Banghart opened for 300,000 and Ricky Green defended big blind. The flop came and Banghart's continuation-bet of 300,000 was raised all in by Green. "OK, lets go," Banghart said, splashing in a call. The turn and river left the jack kicker playing. Banghart shipped over about 3 million and was left with crumbs. Ricky Green raised to 250,000 and Will Pengelly flat-called on the button. 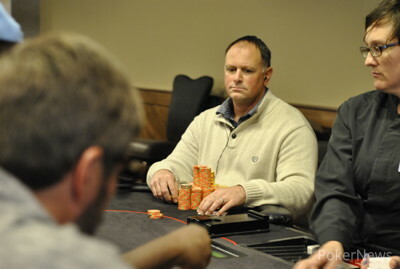 Dean Baranowski re-raised all in for his last 1,350,000 and Green quickly folded. Pengelly called and said, "Let's gamble!" The flop came and Pengelly flopped a pair of sevens to take the lead. The on the turn and the on the river were no help to Baranowski as he hit the rail with his $144,000.